5 SHATTERPROOF LENSES: Beside main polarization lens, we also provide 4 more lenses (Mirrored, yellow night vision, brown, clear anti-fog) to get you prepared for all conditions. Please be noted that these four lenses are designed for different occasions and NOT polarized. DELICATE DESIGN AND PROTECTS EYES: Flattering lines features create aesthetically pleasing appearance. 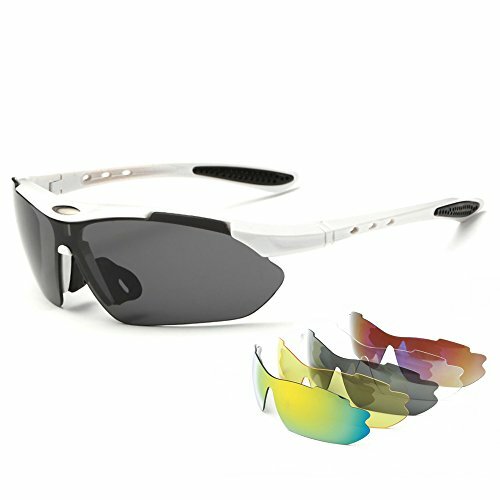 High quality stress-resistant polycarbonate frame material provide the ultimate in performance and comfort. It is both lightweight and durable for all-day protection. CLEAR, SUPERLIGHT, STYLISH AND DURABLE: Lightweight design is suitable for outdoor sports like Cycling, fishing, driving, skiing, riding, racing, motorcycle, climbing, traveling and other sports. 30 DAY MONEY BACK GUARANTEE: If you are not completely satisfied with our product or your purchase please contact us, we\'ll be happy to help. You have no risk to try and we will provide you the best service! They're just was I was looking for!